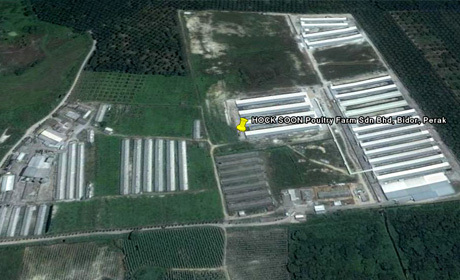 Starting in 1979, Hock Soon Poultry Farm Sdn Bhd, located at 4th Mile, Jalan Sungkai, 35500 Bidor, Perak, Malaysia. the group produces more than 1.2 million table eggs per day, making it the premier egg producer in the northern Peninsular Malaysia. The farm is located on over 20 hectares with a total employee strength of over 150 persons. The complex comprises the office, marketing facilities, feed-milling and the state of the art egg-grading and poultry rearing facilities. The management is committed to continuous improvement, constantly upgrading its service and performance standards to make it one of the most cost-efficient egg producers in Malaysia. The company is committed to providing products with the highest level of quality supported by a comprehensive use of technology for sustainable agriculture. Hock Soon Poultry Farm was founded by Mr. Ong Kim Hock in 1960s in the state of Selangor. Initially, the farm started with just a few hundreds hen-chickens producing a small numbers of table eggs a day. In 1979, assisted with his sons, Hock Soon builds another layer farm in Bidor, Perak with a production capacity of 30,000 eggs / day and continued the expansion process. At this stage, Mr. Ong Boon Leng realized that the traditional labor intensive open house system will be a limitation for the layer farm to continue to grow bigger. After years of surveys and research, Hock Soon finally decided to engage a new and innovative automated closed-house system from German to further expand farm production to 300,000 eggs /day in year 1996. This system comprised of computer controlled ventilation and cooling system with automated feeding and egg collection system and electrically operated scraper to the manure. In 1999, a fully computerized feedmill with production capacity of 5,000 mt was build to cater the need for the fast expanding egg production. Mr. Ong Hong Hui, a member of the third generation of Ong family, joined the Management Team in year 2000. With his expertise in business administration and finance as well as computerisation, Hock Soon’s development pace was accelerated even faster. 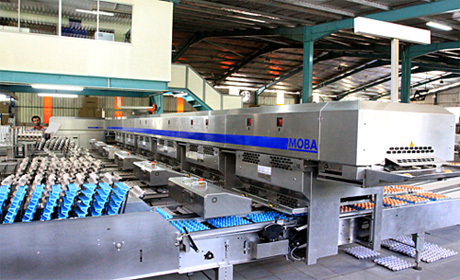 With the success in mastering the technique of closed-house operation system, Hock Soon ceased the operation for all traditional open-house in year 2004 and the farm transformed into a fully automated egg production complex. In order to contribute even more to the environment, Hock Soon started his fermentation organic fertilizer plant in 2007 to treat the poultry manure and turn them into environment friendly fertilizer. In 2012, Hock Soon completed their final expansion of farm production to 1.2 million eggs a day. At the same time, Planning for a second 1.2 million eggs production complex is on the drawing board.